The MGRV8 was finally released for public viewing in October 1992 and went on sale several months later. The demand in the United Kingdom was never as strong as it had been hoped, the price of Twenty Six Thousand British Pounds a major drawback. However in October 1993 "Rover Japan" displayed the RV8 at the Tokyo Motor Show and the reception was that of "Star Status" with some 1300 orders having been secured soon after the show. Of the 2000 RV8’s produced over 75% found there way to Japan. A small number were also exported to mainland Europe. 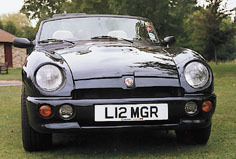 The final car was produced on the 22 November 1995. Quick note: I once met at Guilford Art School the guy that designed the back of the MGB. We all often joke that the guy that designed the front of some car never met the guys that did rest of car - in this case the designer admitted he never even had a 'phone conversation with the guy who design the front.